Abbotsford Arts Council is hosting a free family event on June 4, 2016 from 11am-4pm located at 2387 Ware Street, Abbotsford. 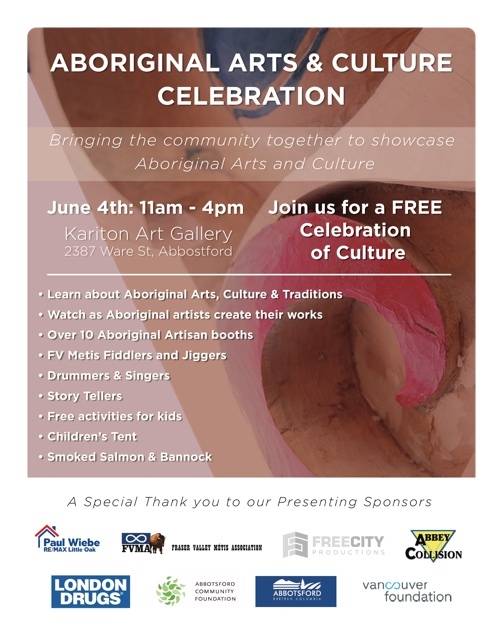 In recognition of Aboriginal Awareness Month, Abbotsford Arts Council is honoured to present the First Aboriginal Arts and Culture Celebration, an opportunity for the community to come and learn about Aboriginal Arts, Culture and Tradition. 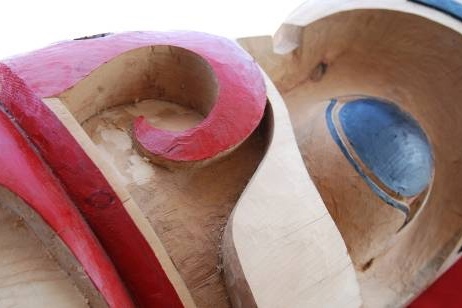 You’ll have the rare and unique opportunity to watch Aboriginal artists create their work on site and purchase directly from the artist and the children’s tent will be offering free crafting stations, face painting and games for kids to enjoy. Darren Charlie of Sts’ailes Nation along with Matsqui First Nation youth drummers will open the event with a welcoming song, prayer and opening remarks. The centre stage will feature traditional Sto:lo story tellers, holistic teachings, Metis fiddler, jiggers, native flute playing, drummers, singers and dancers. Bannock, smoked salmon and water will also be available for purchase at the artisan tents.